Well, Opening Day is upon us. In my family, whether it's MLB, College, High School or Little League, there is no other day that seems so full of hope and optimism in all of sports. All of our teams are undefeated. All of those white pants shine bright with the possibility of safe slides into home. All of the stats are waiting to be calculated with record breaking numbers. When it comes right down to it, Opening Day is all about dreaming the biggest of big dreams. Sure, our dreams on this day might range from highly unlikely to absolutely delusional, but on Opening Day no one can deny us our great expectations. Which brings me to the subject of dreaming big. Most of the young ball players you will see hustling out to their positions this season have some pretty lofty aspirations. I remember when I had three players eleven years old and under. All three of them would have told you that they would one day grow up to play in the Majors. Their eyes were glued to ESPN most days. Baseball cards of their heroes were laid out in rows on their bedroom floors. They could have told you what information would one day be listed on their own cards. At the age of five, my youngest could imitate every single Red Sox player's batting stance perfectly. He would perform each for me and I had to guess who was who and then he would show me his own stance. I remember piling a bunch of ten year olds in my SUV on the way to baseball practice and listening to them talk to each other about how they would be roommates in college playing for the same team and then they would all be drafted to the same Major League team and would live happily ever after. I remember that when we took them to Major League games they would stand with wide eyes watching their heroes at batting practice. I knew how their little minds raced with visions of the day they would be on the big field. They imagined seeing their names and faces on the jumbotron. They believed these dreams with all of their little hearts. Of course, I could have stopped them. I could have talked to them about statistical odds or their athletic genetics or lack thereof or any number of things to snap them into reality. I could have read to them from numerous articles I've seen circling the internet with titles along the lines of, "Face it. Your Kid is Not Going to the Pros." I understand the point of these articles. They are aimed at parents. Some are written by doctors who are concerned with the way parents push their children too hard which can result in injury. Many of them are by coaches frustrated with the push back they get from overzealous parents when they feel their kids aren't getting opportunities. Many are by child psychologists just trying knock some sense into folks whose perspective might just be a little off. And certainly there is a need for this kind of reality check for some people. Who among us has not almost rolled their eyes out of their head while listening to someone who "totally thinks Little Johnny is the next Bryce Harper" or who loves to throw out his kid's velocity numbers and batting averages just loud enough for everyone in the whole darn ballpark to hear? I suppose one could make the case that parents like this will ultimately have a negative effect on their children, but I'd contend that in honor of the wide open possibilities of Opening Day, maybe we just give everyone a little bit of a break today. When I hear talk about crazy parents with pie in the sky notions about their children, I try really hard to remember that far and away, most moms and dads are doing the best they know how to do. Have I gritted my teeth a few times? Yes, too many times. But I try to remember that to live in a country in a time like this when any child has the opportunity to chase after any dream is a gift. To have a parent fully support that dream is equally valuable. Most parents' intentions are good and honorable. Most of them just love the heck out of their children and want what's best for them. I think the most important question is, "Who is actually dreaming that dream?" As long as you're sure it's your kid's goal that you're supporting and not your own, then I say, let them dream as big a dream as they want to dream. For most there will be a time for the reality check, but in my experience, there's no need to start spouting off the unlikely odds. Most often, I've seen that kids figure these things out on their own. They seem to adjust their dreams accordingly all by themselves. By the time he was a freshman, one of my sons realized on his own that he would not play past high school. He focused on playing his best on his JV and Varsity teams and turned his attention to his passion for sports journalism. After years of juggling Little League and travel baseball with basketball, one of my kids determined that baseball was not the sport he loved most, so he determined to focus all of his attention on hoops. 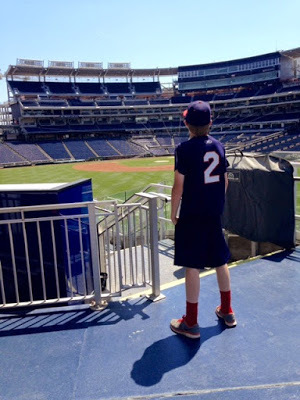 On the other side of the coin, one of my son's teammates determined that he wanted to play baseball for the Naval Academy when he was around 10 or 11 years old. Seemed like a pretty tall order for a kid that young. Except he pitched for Navy just a few weeks ago. Two of the kids who used to sit in the back of my SUV dreaming of playing college ball just signed their commitment letters last week. And just so you know, a quick Google search tells me that there are 40 players on an MLB roster and 30 teams. Math is not my strong suit, but that sounds like 1200 kids whose dreams came true. Maybe I've got my head in the clouds today and stars in my eyes. But it's Opening Day, Friends! The Nats could win the World Series! The Texas Longhorns could show up in Omaha again! Your kid could win the Cy Young one day! Everything is possible today! So let your little man tell everyone what his "walk-up" song will be when he plays for the Sox. Smile and nod your head at that parent who's aiming that radar gun at his 9 year old pitcher. Dream a big dream today. Sure is fun, isn't it?